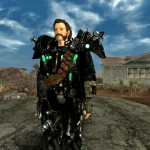 This mod is simply two compatibility files that I use when using the Courier 6 Power Armor. The first addes the advanced recon nightvision, water breathing and target acquisition potential. The second adds Project Nevada visor overlays and thermal/EM vision.